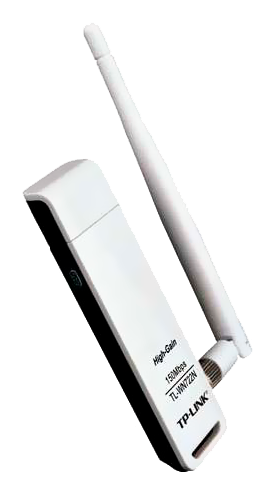 Wireless N USB Adapter TL-WN722N allows you to connect a desktop or notebook computer to a wireless network and access high-speed Internet connection. Complies with IEEE 802.11n, they provide wireless speed up to 150Mbps, which is beneficial for the online gaming or even video streaming. Also, wireless security encryption could be established simply at a push of QSS (Quick Setup Security) button, preventing the network from outside threats. TL-WN722N features WI-FI Protected Setup (WPS) that allows users to almost instantly setup their security simply by pressing the "WPS" button automatically establishing a WPA2 secure connection, which is more secure compared with WEP encryptions. Not only is this faster than normal security setups but more convenient in that you don't need to remember a password!